Have you jumped on the Instant Pot bandwagon yet? If not, you’re really missing out! Electric pressure cookers seem a little scary but they’re so easy to use and make cooking meals quick! The Instant Pot 7 in 1 multi-cooker is what I have and it does everything. You can brown your meat right in it then pressure cook in minutes for a perfect result! But there’s a secret a lot of people don’t know. You can cook sooo much more than meat in the Instant Pot. For example, cheesecake or yogurt! Woohoo! 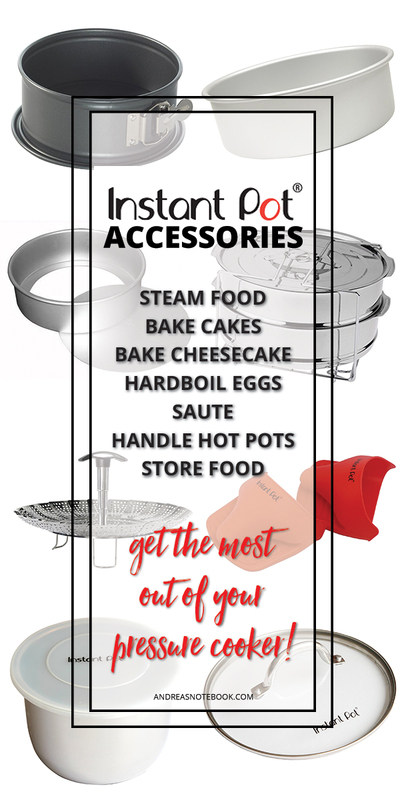 But you’ll need a few accessories to really get the most out of your instant pot so I’ve gathered some Instant Pot accessories to make it easy for you. Instant Pot Yogurt Cups. Make yogurt in your pressure cooker! These are must haves! Round dessert pans for a 5 or 6 qt. pressure cooker. 2 pans for twice the amazingness. I haven’t used this is perfect for cooking 2 at once. Round cheesecake pan with removable bottom. 7″x3″ is great for the 5 or 6 qt pressure cooker. Lots of sizes available. 7″ round cake pan. Perfect for 5 or 6 qt. pressure cooker. Stainless steamer with extending handle. This is great for steaming anything, You can use this in regular pots and pans as well. Extra silicone seal rings. You’ll need these! The flavors from your foods will begin to soak into your silicone seal rings and over time they’ll start to break down a bit so you’ll need to make sure the one you’re using is in excellent condition. Have a couple extras on hand for that time when you’re about to cook dinner and realize you need a new ring. Instant Pot glass lid. This is used for the saute or slow cook functions. Silicone mini mitts. The pot is H-O-T when it’s done cooking. If you don’t’ have something that can easily grab hot pots, get something. 7″ Springform pan. Perfect for cheesecake! I prefer a springform pan for cheesecake and this one works perfectly. Need some Instant Pot recipes? Start here with these Paleo (and delicious) recipes the whole family will love! Stunning Work, I appreciate your efforts. Please keep it up. Very Nice Article. Thank You. Waiting for Your Next Article. Thank you andreas for showing us, how to use the instant pot accessories for making cheese cakes. I appreciate it. Very nice and helpful article. Waiting for your next article. Thank you.